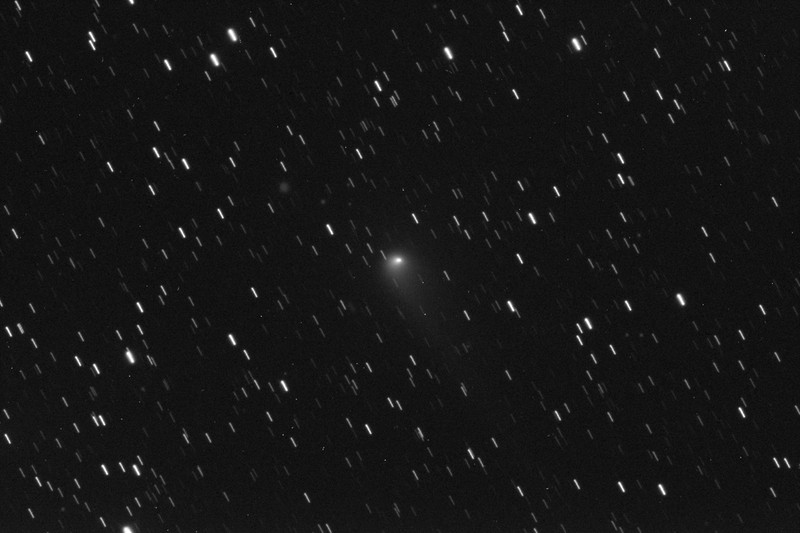 Comet C/2013 X1 (PANSTARRS) currently in the constellation of Andromeda at a brightness of magnitude 9.2. Comet C/2013 X1 is expected to get brighter with perihelion, its closest approach to the sun at a distance of 1.314 AU (astronomical units) on 20.04.16. Comet C/2013 X1 (PANSTARRS) is expected to pass within 0.6 AU of Earth mid June 2016 and predicted brightness magnitude of 7.5, possibly visible with binoculars from very dark sky locations. A comet can be described as a dusty snowball, made of ice, dust and frozen gases such as methane, carbon dioxide, ammonia and other gases come from a time when the solar system was forming. They often have highly elliptical orbits and varying orbital periods. As they travel towards the Sun, the comet nucleus heats up and starts to outgas, developing a nebulous fuzzy coma around the nucleus and pressure from the solar wind causes a tail to form that points away from the Sun. This 600 second luminance image of C/2013 X1 (PANSTARRS) was taken on 30.11.15 at approx 21:45 GMT when it was at its highest point in the sky. Image was taken remotely using the iTelescope network in Nerpio in Spain using a 12.5″ Planewave CDK telescope and SBIG-STXL-6303E CCD camera.